Image for the side of the blog! That’s something I have been talking about with my clients and business partners quite a bit lately. Your marketing has to be active. It has to be engaging and consistent and it can’t be something that just lays dormant for an extender period of time. Examples of active marketing are you answering comments on your Instagram posts, putting out new content on your blog, vlog, or podcast, and of course updating the creative for any paid advertising you are doing. What is the best way to be more active in your marketing? I believe the answer is Video. Video is the single biggest way to connect with people on a personal basis online right now because of the personality it gives you. If you have an amazing blog or podcast don’t fret I am not suggesting you stop doing this. However for content on your social media channels, emails, and more VIDEO IS THE QUEEN! How do I create more video? I suggest creating video from everything you are doing. 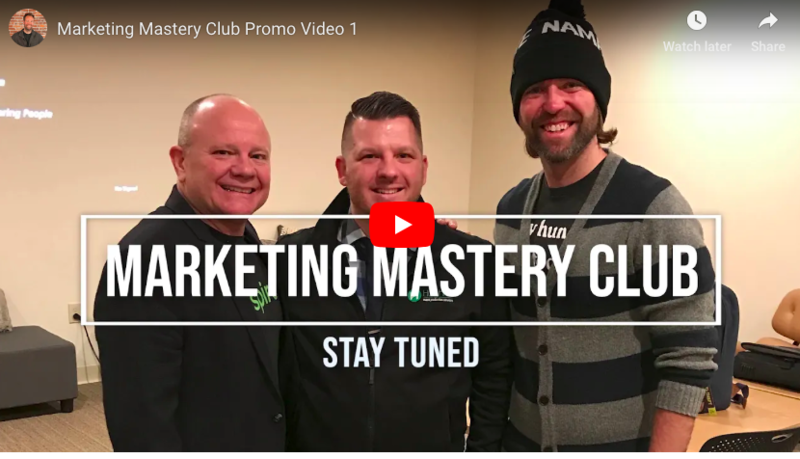 We put on a live event once per month called the Marketing Mastery Club and at the top and bottom of these blogs are videos that our guy Patrick P created from the event we were already putting on. No extra time was necessary to create the content. You can do a roundup video of what you are seeing in your industry once per week, you can do a tips video suggesting new ideas for your clients, or you can do a live video where you are there to answer questions for your community. How much more video should I create? I believe every business should be creating, sharing, and posting AT LEAST one video per week right now. There are a myriad of ways you can utilize this and repurpose it. From organic content to email marketing to your website to showing folks in person to paid advertising the opportunities are endless. The videos don’t need to be that long either; just 1-5 minutes in length depending on the topic. But Mike, video is expensive isn’t it? The type of video I am talking about can be shot on an iPhone and edited in iMovie. And if you really aren’t comfortable in front of the camera do animated videos with a platform like Raw Shorts. That should handle all of the objections :)! Active Marketing takes time and energy and utilizes the Passionate Marketing Revolution by putting People and Purpose at the forefront of your strategy. Create your video around People and Purpose and providing value and solutions for your customers and take an active instead of reactive approach to your marketing! You’ll be happy with the results. I guarantee it. This post should of course start and end with a video I hope you enjoy them both. Comments below and thanks for taking the time to read this!